The Chinese Lunar New Year in LA has always been a no-brainer. Just head on over to Chinatown for their annual Golden Dragon Parade and festival. But this year it seems like everybody is trying to horn in on the action. This is the year of the pig, although I prefer the old-fashioned interpretation of “earth boar.” Others are making it all fancy, calling it “The Year of the Golden Pig.” Here are some events starting tomorrow, Saturday, January 25, 2019 and continuing through February 17, 2019. There is almost no overlap, so you can hit them all! Chinatown kicks off its New Year festivities February 4, 2019, at 10:00 p.m. at Thien Hau Temple. The late hour and small crowd add a heightened sense of drama to the monks’ incense-burning ceremonies, dragon dancers and 500,000 firecrackers to awaken the spirits. 756 Yale St Los Angeles CA 90012. Chinatown’s festival runs from noon until 8 p.m. in the Central Plaza, West Plaza and Blossom Plaza. The Golden Dragon Parade will begin at the intersection of Hill Street and Ord Street at 1 p.m. You can purchase grandstand tickets by calling (213) 617-0396 or visiting their website. The festival will include photo ops with original 1940 vintage cutouts, live music, a craft market, acrobats, Lion Dancers, Calligraphy by Guojian Cui, Face Painting by Tai-Ling Wong, and my favorite–Candy Sculpture by Shinobu Ichiyanagi as well as Sean Wang and students playing the Chinese zither (and when do you ever get to say zither outside of an Edward Gorey story?) Oh, and we can’t forget the Capuchin Monkey! 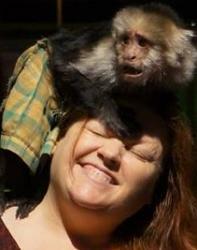 Do not touch the monkey, and remain calm if he freaks out and jumps on your head as he did with me one year. There will also be Gourmet Food Trucks and a Craft Beer Garden, but there will be so many fantastic restaurants, delis, bakeries, and food stalls, why bother? The Beverly Hills Conference and Visitors Bureau in partnership with a lot of Associations for Cultural Exchange presents “Happy Chinese New Year, Charming Jing-Jin-Ji.” The three-part event includes a “Jing-Jin-Ji” photo exhibition and a cultural heritage crafts display with demonstration featuring Peking Opera costumes, ceremonial tea service, and traditional folk music, as well as a variety show featuring performance groups from Beijing, Tianjin and Hebei including Chinese acrobatics, martial arts, folk dance, and Peking opera. The event starts at 3 p.m. Tickets are $10 each. Monterey Park’s New Year’s festival is huge. We are talking about a five-block carnival and street fair with folk art, street food, rides, vendors, and live entertainment. Saturday morning at 10 a.m. the beginning of the festivities is marked with dragon dancers and lion dancers. And yes, there will be firecrackers. SO MANY firecrackers. Downtown Monterey Park on Garvey Avenue between Garfield and Alhambra Avenues. The Americana at Brand observes Chinese New Year with displays featuring sculptures and oversized lanterns, dragon and lion dances, and a K-pop dance ensemble. Probably the best way to celebrate the Lunar New Year is by enjoying some dumplings at Din Tai Fung. The beautiful grounds of The Huntington will be hosting a 2-day celebration for the beginning of the Year of the Pig, from 10 AM until 4 PM both Saturday and Sunday the 3rd and 4th. Special events are included with the price of admission. Starting at 10:30 AM on both days, the Shaolin Temple Cultural Center will present a martial arts demonstration, Lion dancers, a mask-changer, dancers, and music, as well as brush-painting, calligraphy floral arts demos and crafts activities in different locations around the gardens. From 10 AM until 4 PM there will be a photo booth where you can pose with lion dancers and martial arts experts and receive a digital download and two 4X6 prints for $15. Adult General admission is $29. 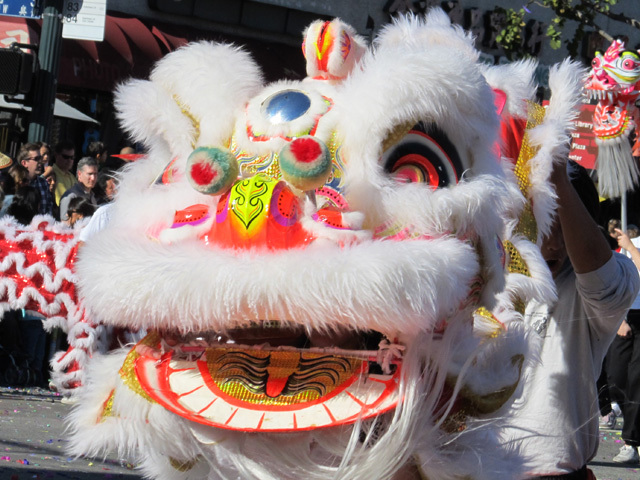 From 10 a.m. – 4 p.m. the USC Pacific Asia Museum in Pasadena will present Lion Dancing, a martial arts presentation, a classical symphony, Taiko drums, and a variety of traditional and contemporary music and dance. In addition, you can enjoy art activities, food trucks, and a musical petting zoo. We don’t even know what a musical petting zoo is. but we are totally into it. Although Shanghai Nights runs from 6 p.m. – 10 p.m., it is a family-friendly, if upscale event. Celebrate the year of the pig with Chinese culture, cuisine, and entertainment. The beautifully decorated Queen’s Salon will host the seated, buffet-style Chinese dinner at 6 PM, which will be followed by a spectacular show. It wouldn’t be the Chinese New Year without Wushu Shaolin Lion and Dragon dancing. Other performers include a guzheng musical ensemble, a Kung Fu demonstration, the Wushu Warriors Shaolin acrobatics with a Chinese Ribbon Dance and a Chinese Face Changer–a face changer? I am intrigued. From 11 a.m. until 8 p.m. the San Gabriel Mission District will be hosting its annual Lunar New Year Festival. The event “combines tradition with modern celebrations” and features a street food fair, marketplace, carnival games, a chalk art contest, kids’ zone, live bands, and performances including dance troupes, lion dancers, acrobats, and traditional Korean dance. San Gabriel Mission Playhouse 320 S Mission Drive, San Gabriel, California 91776. At 2 p.m. Santa Monica Place will come alive with colorful lion dancers, Korean fan dancers, stilt walkers, and a K-pop dance group, with host Comedian Paul “PK” Kim. You can also enjoy watching a traditional dough artist, balloon twister, crafts, and classical folk music. Don’t forget to add your wish to the New Year’s Wishing Trees. To celebrate the beginning of the Year of the Pig, The Original Farmers Market will be hosting a celebration in partnership with The Grove from 2 p.m. until 5 p.m. on Saturday, February 2, 2019. Farmers Market Facilities craftsmen have been hard at work creating a handmade pig statue, which will be unveiled by Councilman Ryu, District 4. The unveiling will be followed by a Kung Fu demonstration, a magic show, acrobatics performances, traditional lion and dragon dances, live music with traditional Chinese instruments, Korean fan dancers, face painting and themed craft-making stations. At 3 p.m. learn how to make dumplings or lanterns or try your hand at calligraphy. This entry was posted in Art, Attractions, Food, Music, Theater, Upcoming Events and tagged 120th Annual New Year Festival & Golden Dragon Parade in Chinatown, Chinatown, Chinatown's Midnight Temple Ceremony, Chinese Lunar New Year, Chinese New Year at Santa Monica Place, Chinese New Year Festival in Monterey Park, Lion dancers, Lunar New Year at the Americana at Brand, Lunar New Year Festival Hosted by USC Pacific Asia Museum, Queen Mary's Chinese New Year Shanghai Nights, San Gabriel's Lunar New Year, Shanghai Night, The Beverly Hills Conference and Visitors Bureau, Thien Hau Temple, Year of the Pig. Bookmark the permalink.